Midnight Cowboy on VHS. Movie starring Dustin Hoffman, Jon Voight. With Brenda Vaccaro, John McGiver, Sylvia Miles, Ruth White, Barnard Hughes. Directed by John Schlesinger. 1969. 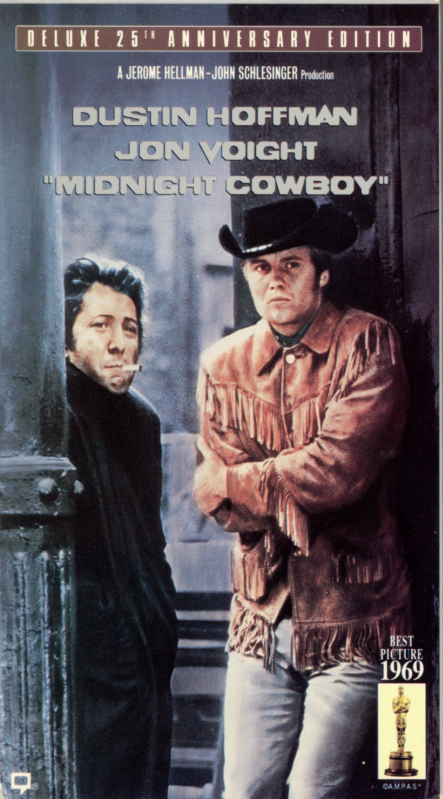 Twenty-five years after its original release, “Midnight Cowboy is still heartbreaking — and timeless” (The New York Observer). This deluxe collector’s edition includes a newly remastered print, Dolby surround stereophonic sound, a special documentary featuring screen tests and interviews with the cast and creative team, and the theatrical trailers form both 1969 and 1994. Tough, potent and shocking, the film depicts the tragedy of urban American street life through the experiences of naive “cowboy” Joe Buck (Jon Voight) and sleazy con man Ratso Rizzo (Dustin Hoffman). Arriving in New York with dreams of becoming a gigolo, Buck is unprepared for encounters with people like Rizzo. But as Buck’s dream gradually evolves into a nightmare, the two men develop a poignant and powerful bond.